Is That Ad Following You? I bet you’ve noticed this growing trend in online advertising, even if you don’t know what to call it or how it works. You do some browsing around, maybe look at some things on Amazon or research some new software. Then, you start seeing ads for what you just looked at… all over the web. It’s called remarketing, and it’s going to become even more common. Why? 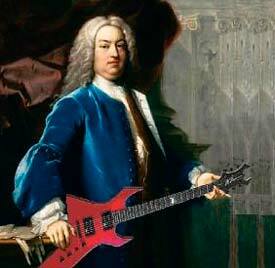 Imagine what Bach would do with an electric guitar... it would probably sound a lot like Van Halen. Ninety years ago a book was being written by a man named Claude Hopkins. That book would reveal an advertising secret that revolutionized the industry. It was called Scientific Advertising and it’s been a “must read” ever since. And, it’s even more useful today, online. There are two components to this method, and I have a pair of acronyms to help you remember them. ART – Always Run Tests. 3D – Data Driven Decisions. Let’s dive in to these old concepts and see how they can drastically improve the performance of your marketing campaigns today. I’m putting the finishing touches on July’s Small Business Newsletter. Use the handy form to your left to get a copy delivered to your inbox! This month’s issue will feature a case study. I’ll explain how exactly one of my clients is doing more business now than he was before the recession!